Just the right place to be! Welcome in south-eastern Poland, where since 2001 we run a professional fishing lodge on the banks of the fabulous river San. You should have been here last week! There is better and worse days while fly fishing - we don't guarantee all good ones, but we will help get the best even out of a bad day. The region is rich in wildlife, stunning views and unspoilt nature. Another good reason to be here. These beautiful fish have found a perfect habitat on the San. However they are a reason of frustration for many anglers - being picky and sometimes almost impossible to catch they make the fishing even more interesting. We travel. Check the destinations where we go regularly and thus could help organizing a trip to. I am lucky to live and fish here in Poland, in one of the last wild places in Europe, in the beautiful mountains of Bieszczady, by the awesome river San. With a group of friends who share the passion of flyfishing, we would be honoured if you join us for this ultimate experience in flyfishing for river trout and grayling. Working for years with hunters coming from all over Europe I realized that there is much more to do than hunt in my country. Fishing was the natural consequence. I started with pike fishing on my lake, then carp on another and finally it had to end with flyfishing. Choosing place and guides was not difficult – I chose the best that exist in Poland! 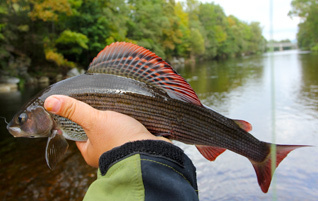 The San was discovered by the fly fishing world in 1985 when the first Flyfishing World Championship was organised – it was a different country in those days. The fishing here was rediscovered in 2005 during the European Championship – now, with Poland being in the European Union, with good infrastructure, and our wonderful fishing – it had to be a success. 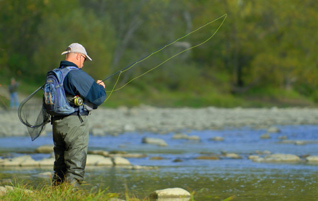 In 2010 World Flyfishing Championship was held on the San. Foreign anglers have seldom visited the San until now – but the Poles have always known of this special, secret place. They practiced and got to the top in most flyfishing competitions. It is among those winners I have chosen fishing guides and flytiers. They know their job very well. This job is fishing. Fishing at the highest level. Fishing in Paradise. Fishing at the Frontier. They are at your service and will guide you through all levels - from the very basic tuition to master-level skills of European and World Champions. They will also tie you perfect flies and teach how to tie them if you wish. You don’t have to worry about accommodation, food, transportation - anything. You are here to fish. I will be pleased to host you and take care of everything. Copyright © 2013 Pioneer Flyfishing Poland Ltd.